A LOCAL mother is urging children and parents to be on their guard after her 16-year-old son found drugs on his way to school. 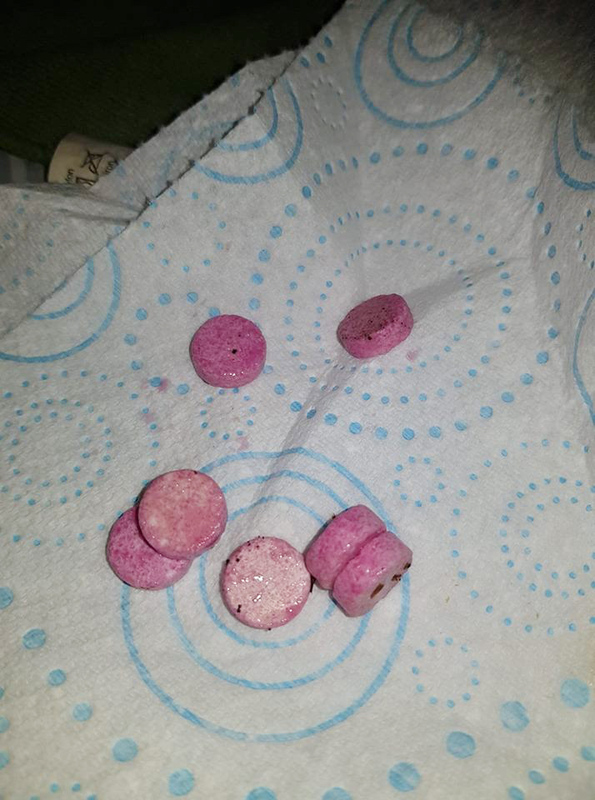 Patricia Lagan Haywood posted an image of the pink tablets, which are understood to be a type of ecstasy, on social media after her son picked up the tablets on Jamaica Road in Ardoyne on Tuesday morning. “My son was walking to school on Tuesday morning when he spotted the drugs lying on the ground. “He lifted them and ran into the house to show me. My first reaction was that I told him to wash his hands immediately as it could have been anything he lifted. “Any child could have lifted them and mistaken them for sweets and God knows what could have happened. Local SDLP Councillor Paul McCusker is urging people to be aware of the dangers of drugs. “I was contacted by residents who were very angry after a child found these tablets. “We are continuing to see an increase in drug-related incidents across North Belfast and I have been raising this with all the relevant agencies on dealing with this.